Many health insurance companies have been or are starting to offer options for health coverage in another country. These expanded options offer a new market for insurance companies, savings for employers and employees as well as give employers the chance to keep their employees happy and healthy. Health Net, an insurance company based in Bakersfield, Calif. is now offering the option to employers in Kern County, which will provide medical care locally or in several Mexican border cities. Health Net has decided to cater to the large Latino population living and working in this area. Lower monthly rates and co-pays or sometimes no co-pays, are some of the perks offered to employees who opt for this health plan." Health Net understands that healthcare is a personal choice and that many Latinos prefer the comfort and traditions of the medical care of their heritage," said Brad Kieffer, spokesperson for Health Net. "Plus, we recognize many of our members have family in Mexico, so this provides convenient access to care for many of their family members." The Salud con Health Net plans give employees the choice of getting culturally sensitive medical care near to where they live or work in California or from doctors and hospitals in the Mexico border cities of Tijuana, Tecate, Mexicali and Rosarito. Health Net works with a Mexican network of doctors, SIMNSA Health Plan. To ensure cultural sensitivity and quality in Kern County, Salud con Health Net utilizes doctors and healthcare professionals at Hispanic Physicians IPA, which provides training to its staff, as well as translators, if needed. Additionally, Health Net of California has received the Multicultural Healthcare distinction from the National Committee for Quality Assurance, which recognizes organizations that lead the market in providing culturally and linguistically sensitive services. Cultural sensitivity in Mexico is not a problem, but for quality they use a network that employs doctors who are certified to practice under the laws of Mexico. While Health Net does not require that employers purchase the cross-border option, they see that many are drawn to this because it's a way to provide their employees the healthcare they desire, whether it is in the U.S. or Mexico. "They are also interested because of the extremely competitive price of coverage compared to other health plans offering U.S. only care. Since it's a new product in Kern County, we are working closely with brokers and employers, and we see there is good interest," Kieffer said. Health Net is able to have more cost competitive rates; they partner with healthcare providers that offer less expensive rates because they share their commitment to serving a mostly Latino population with access to culturally sensitive care. In addition, the cost of care in Mexico is less expensive than in the U.S., so Health Net passes the savings to their purchasers. "Health Net understands employers' challenges in managing ever-growing diverse populations, and we have made it easy and affordable to incorporate Salud products into their health plan offerings. Some employers can see savings of up to 30 percent lower than our full HMO network," Kieffer explained. 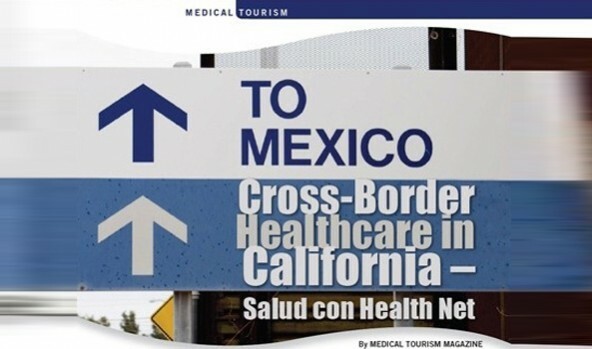 Health Net started offering the cross-border option in 2000 and has expanded it to San Diego, Los Angeles, Orange County and the Inland Empire. Since 2007, it has seen a growth in the Salud plans that have averaged 32 percent annually.Under previous plans, Health Net has noticed that Salud tends to be more popular the closer a person lives to the border. Even though Kern County is a longer drive to the border, they are expecting that some will make the trip, especially if they are visiting family in Mexico. And this is also a very convenient option for their dependents already living in Mexico. Additionally, if they did opt for a procedure in Mexico, under the plan there is no co-pay for hospitalization compared to the $250 co-pay in California. Some insurance companies and employers have not had a lot of success with offering healthcare in a different country to employees. Not all cases have been as close as Mexico and California, some are much more global. One issue that has been a factor is that once the employer offers this option, that's it. The employee gets no education on what this is, how to use it and how it will benefit them. If the employee understands how this works they are more likely to use it. Health Net's approach is to work closely with all of their employers to help educate their employees about how to use their Salud plans. They have a bilingual enrollment specialist to assist with questions about the enrollment process and customer service representatives who are well versed about Salud products and certified in the Spanish language and health insurance terminology. In addition, Salud plans provide access to Health Net's Decision Powers, health coaches, who are clinicians, available in both Spanish and English, who can help members make decisions with their doctors that fit the members' health and lifestyle and help them manage complex medical issues. A major concern for individuals that travel abroad for healthcare is how the follow-up care will be handled. Health Net believes that for specific conditions it is best that there is continuity of care from the same provider, but if someone obtains care in Mexico and requires attention once they get back they may see their primary care physician. The patients records will not be shared automatically, but the company will provide translation services and send records back and forth as needed. Another concern some have is that in Mexico, doctors are not required to carry malpractice insurance, but the SIMNSA network used by Health Net said that a vast majority in this network do carry it. SIMNSA is also licensed by the California Department of Managed Care, the regulatory body that oversees HMOs doing business in California. Additionally, Kieffer said that any complaints can be brought to Health Net, and they will ensure all issues are resolved appropriately. Health Net provides a unique service to companies looking to provide their employees with affordable, high quality and culturally sensitive medical care. Despite some of the concerns, its advantages seem to shine through. But it is up to the employers to decide what plan is right for them and their employees.